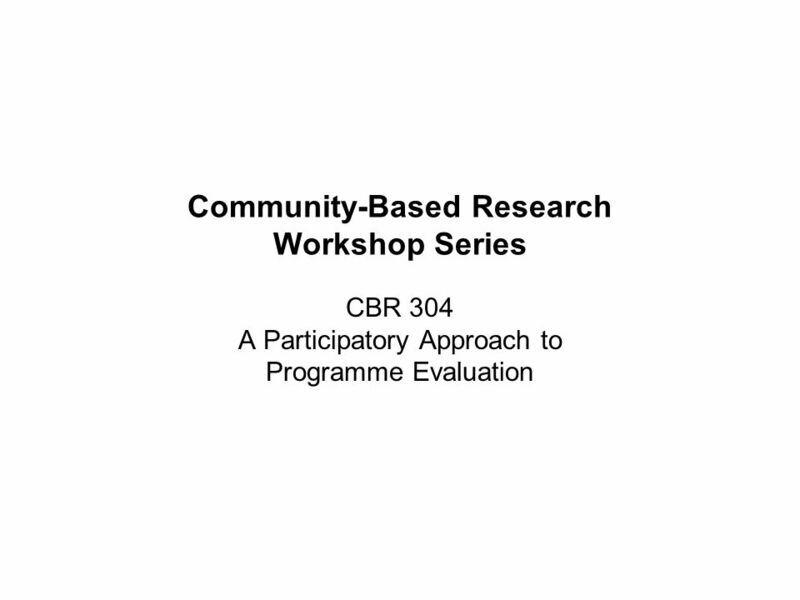 Community-Based Research Workshop Series CBR 304 A Participatory Approach to Programme Evaluation. 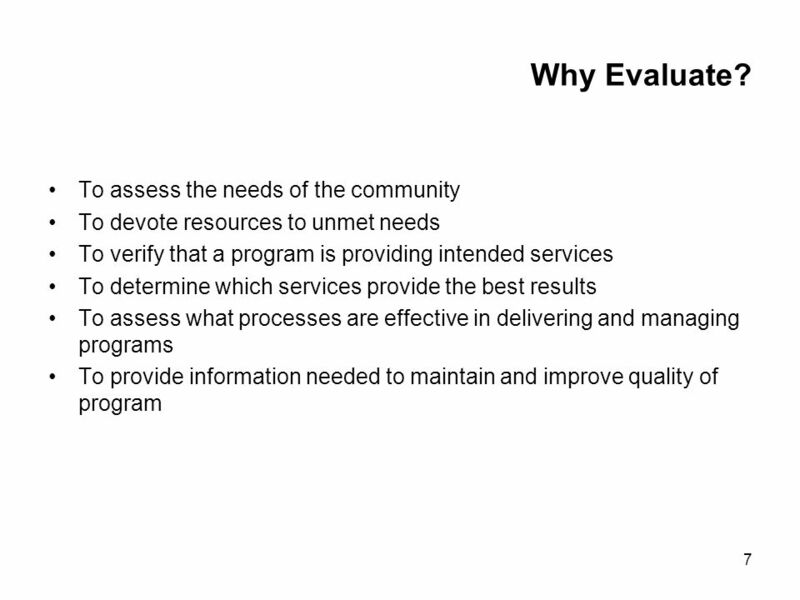 2 2 Things we will cover Why program evaluation? 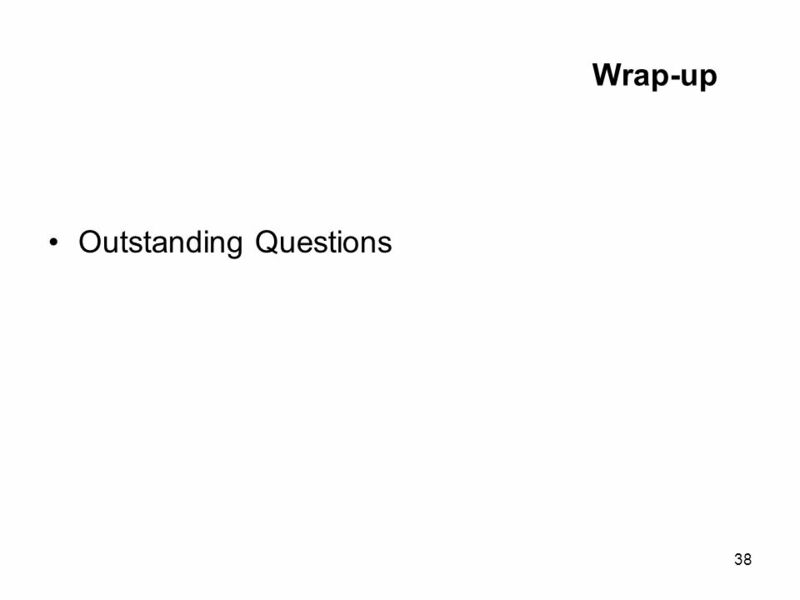 Review lots of jargon. 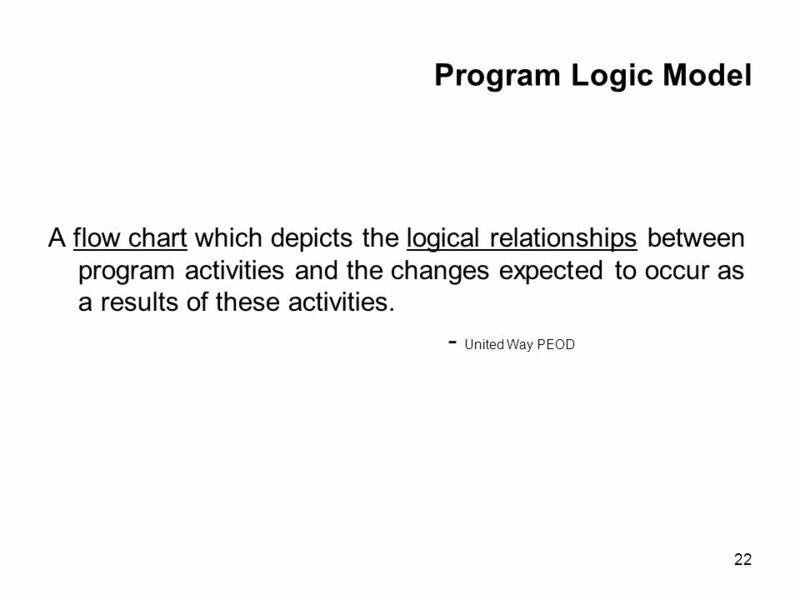 Creating program logic models. 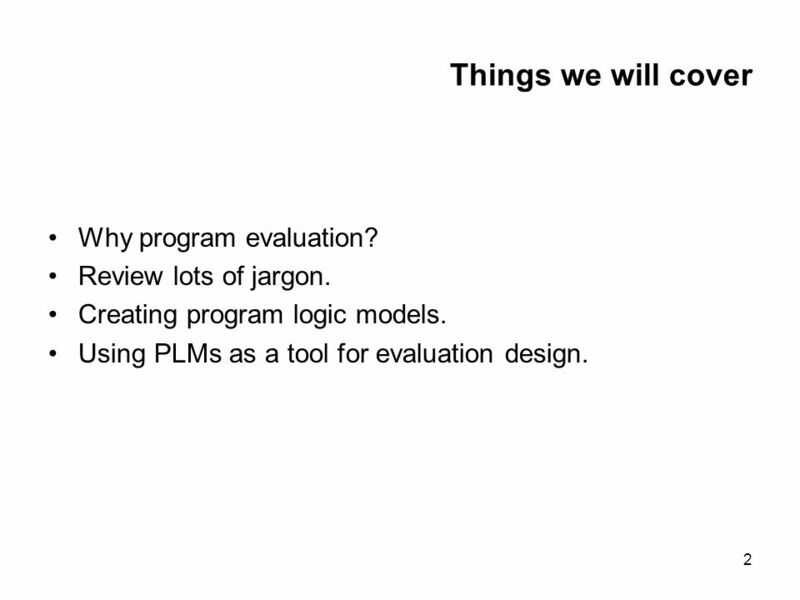 Using PLMs as a tool for evaluation design. 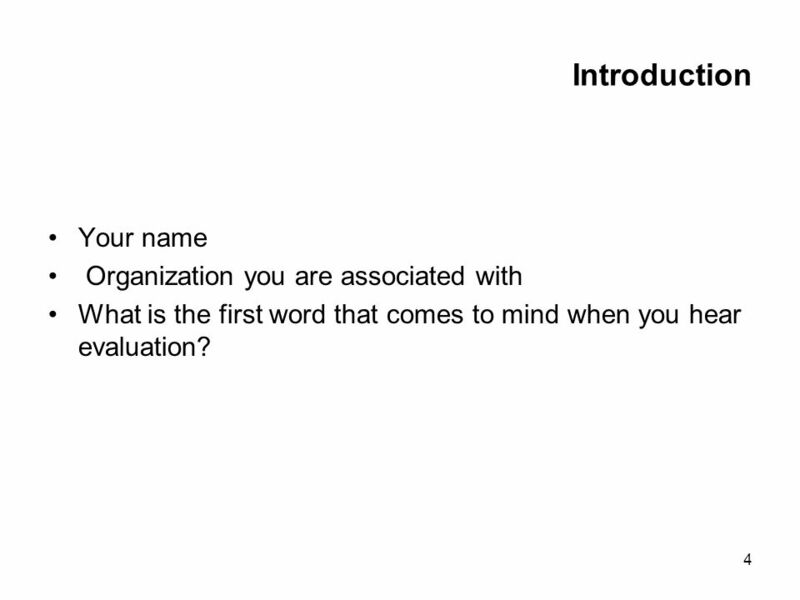 4 4 Introduction Your name Organization you are associated with What is the first word that comes to mind when you hear evaluation? 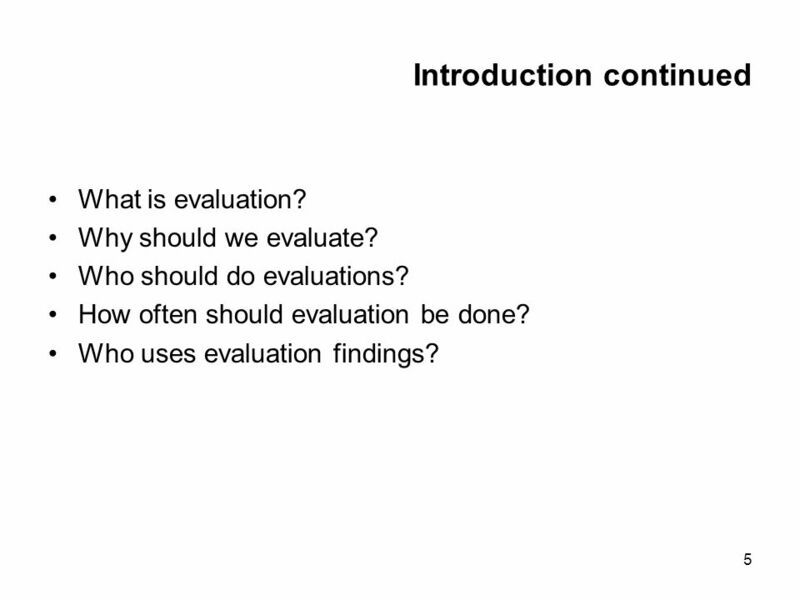 5 5 Introduction continued What is evaluation? 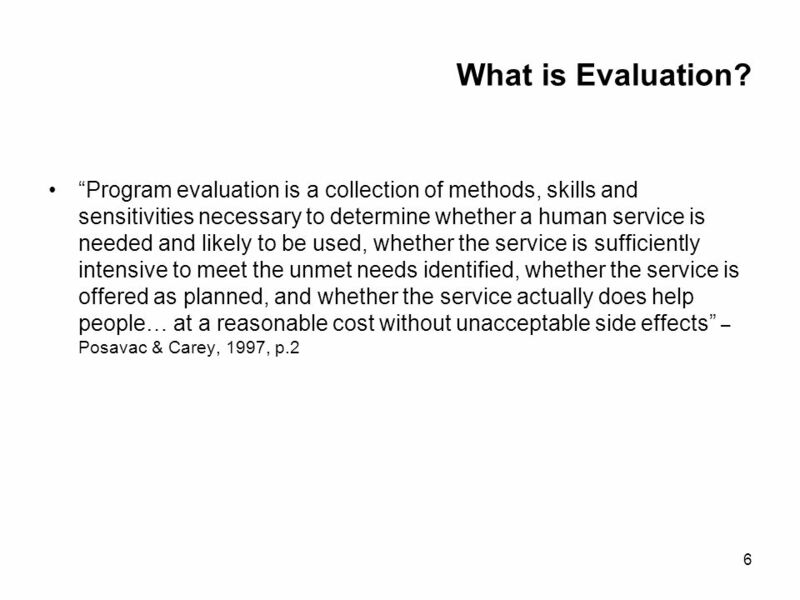 Why should we evaluate? 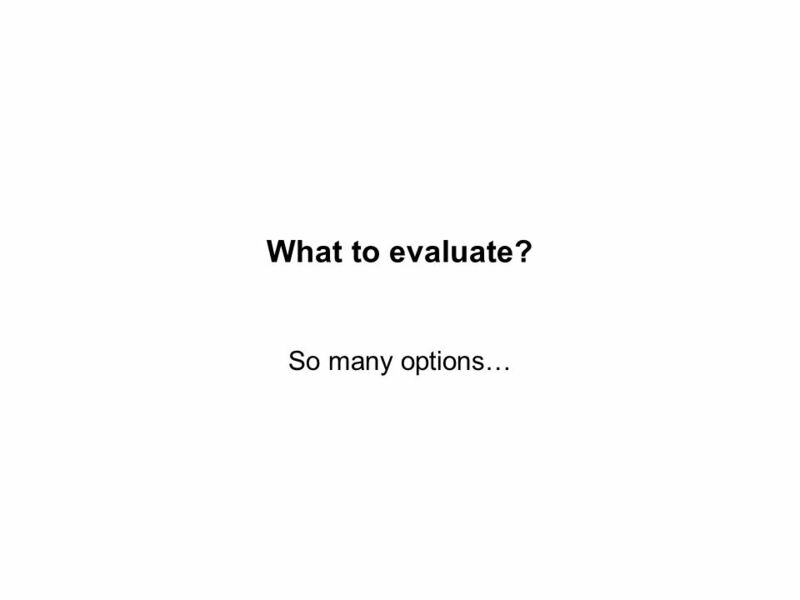 Who should do evaluations? 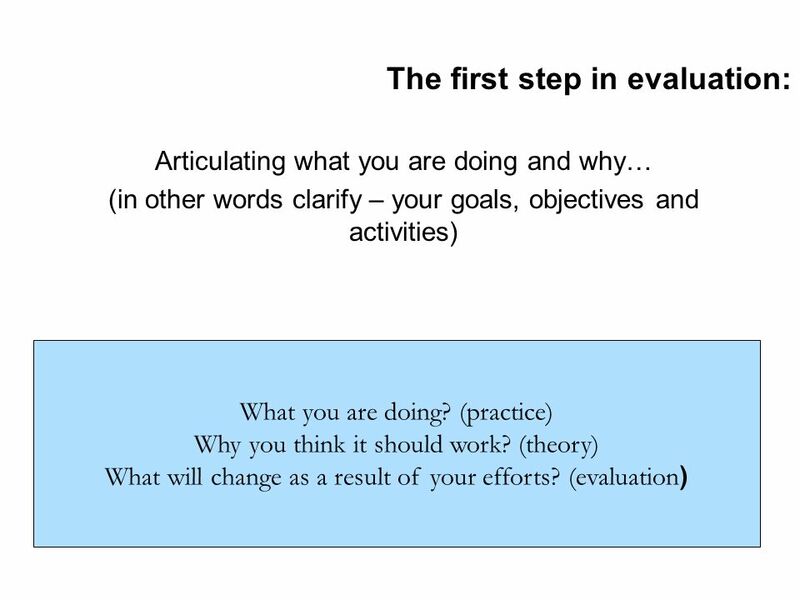 How often should evaluation be done? 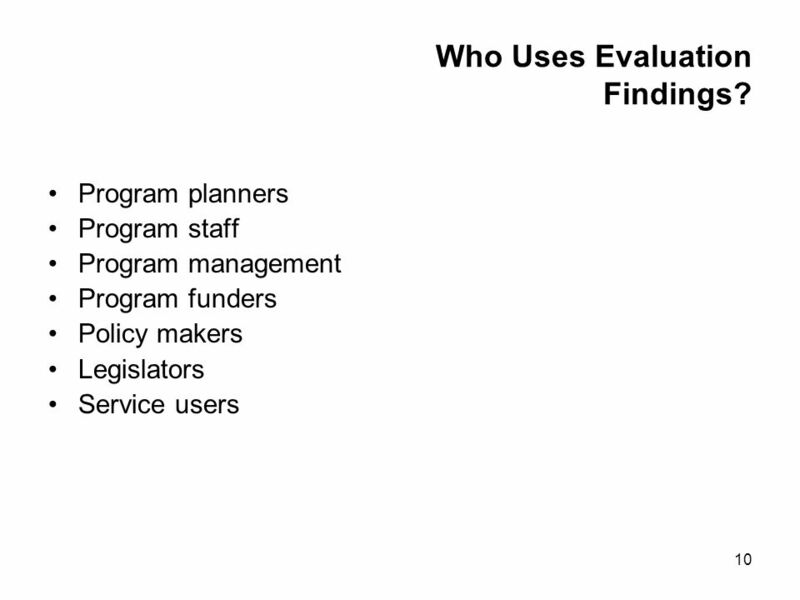 Who uses evaluation findings? 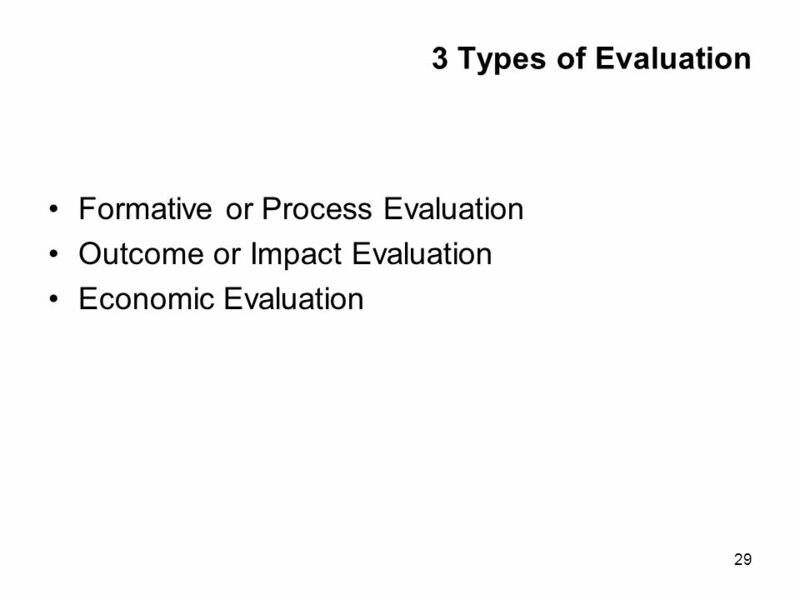 13 13 Small Group What freaks you out about evaluation? What makes it challenging? What makes it exciting? 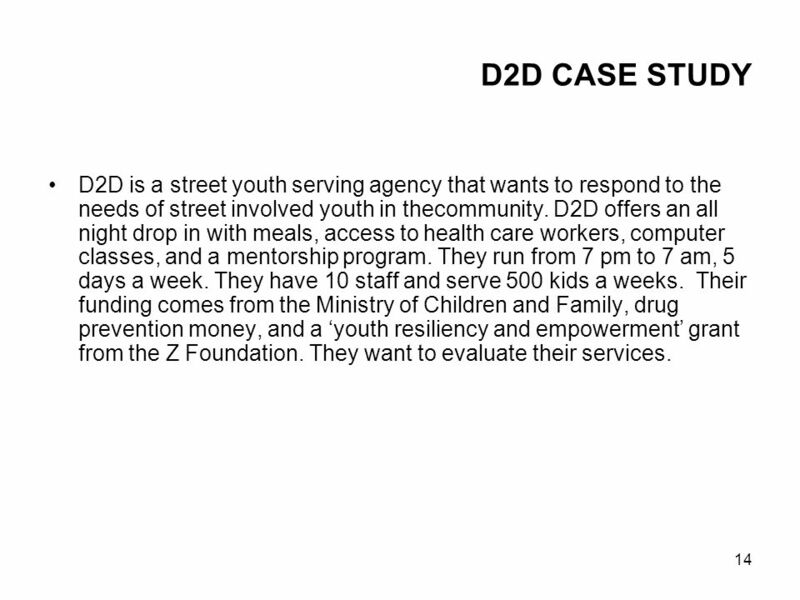 14 14 D2D CASE STUDY D2D is a street youth serving agency that wants to respond to the needs of street involved youth in thecommunity. D2D offers an all night drop in with meals, access to health care workers, computer classes, and a mentorship program. They run from 7 pm to 7 am, 5 days a week. They have 10 staff and serve 500 kids a weeks. Their funding comes from the Ministry of Children and Family, drug prevention money, and a youth resiliency and empowerment grant from the Z Foundation. 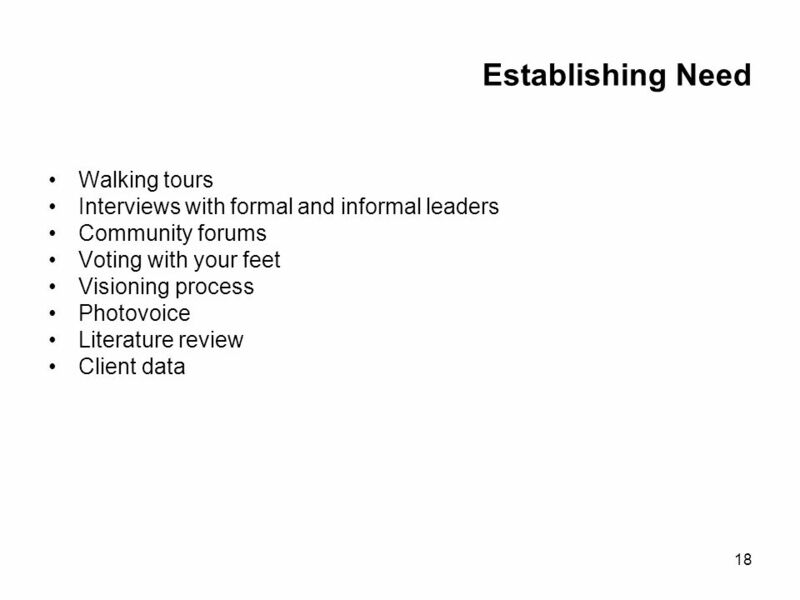 They want to evaluate their services. 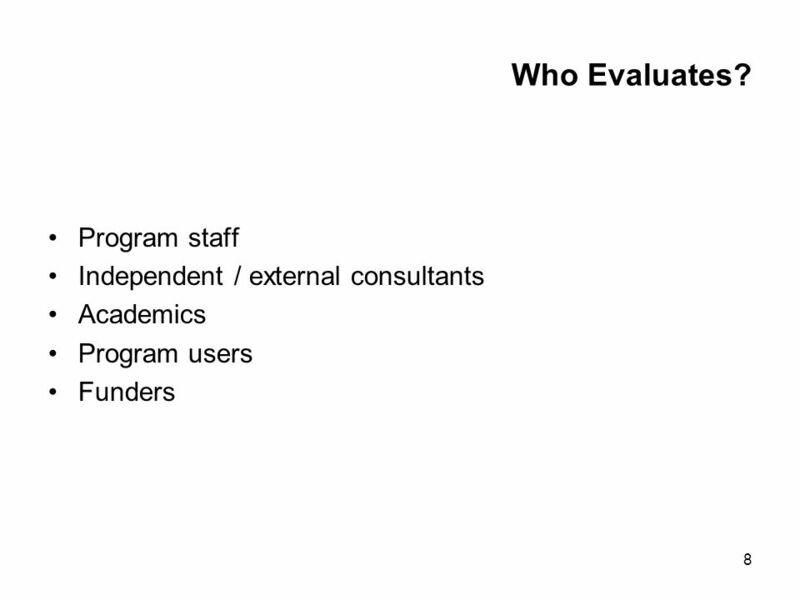 15 15 D2D CASE STUDY 1) Who do you think should be on your evaluation team? (Why?) 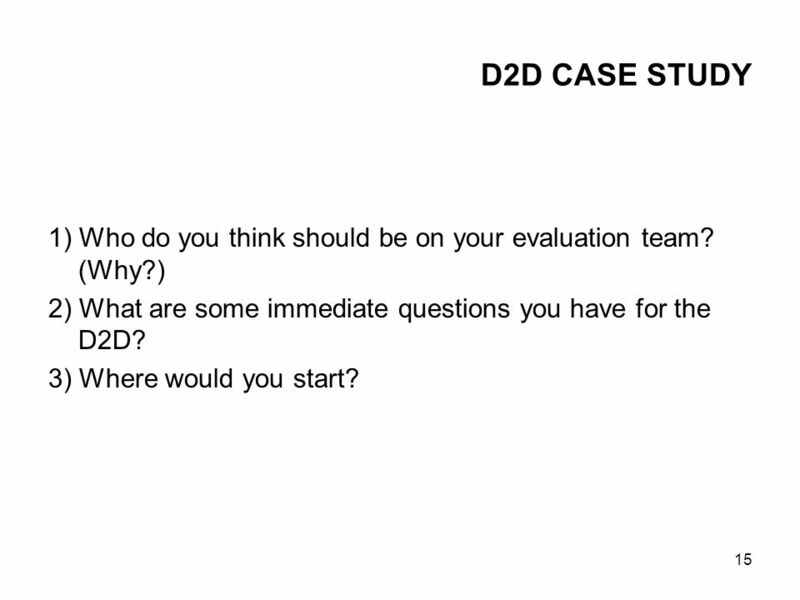 2) What are some immediate questions you have for the D2D? 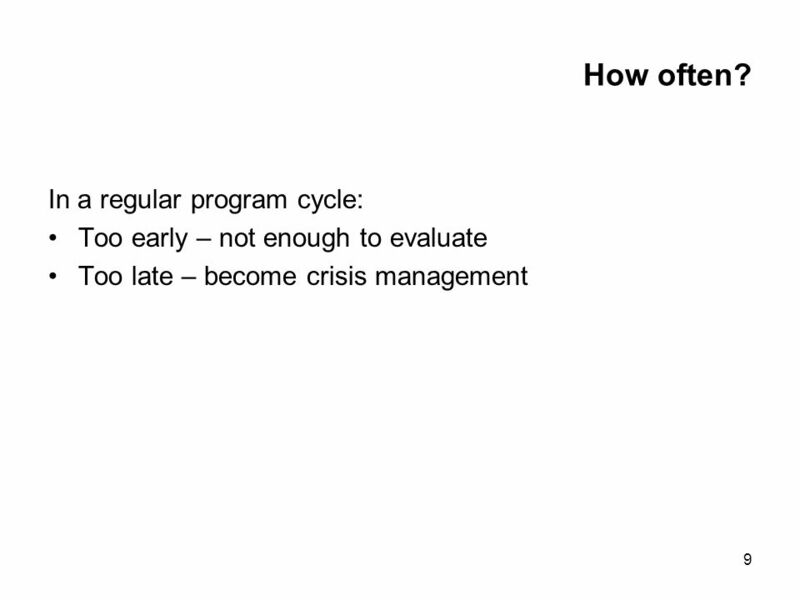 3) Where would you start? 16 Where to start? 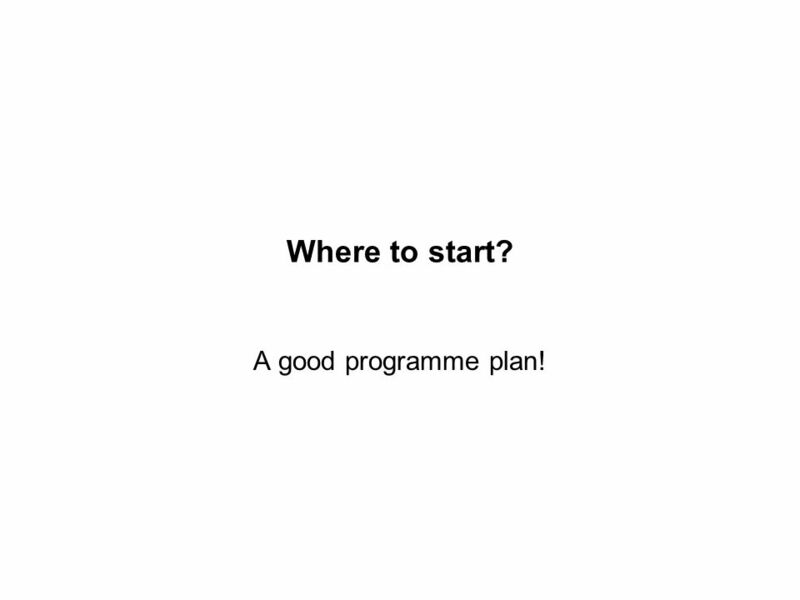 A good programme plan! 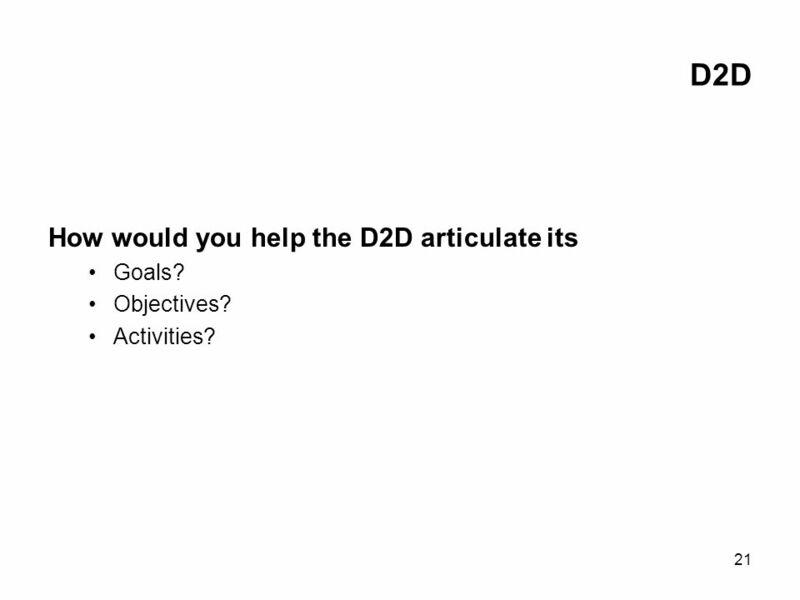 21 21 D2D How would you help the D2D articulate its Goals? 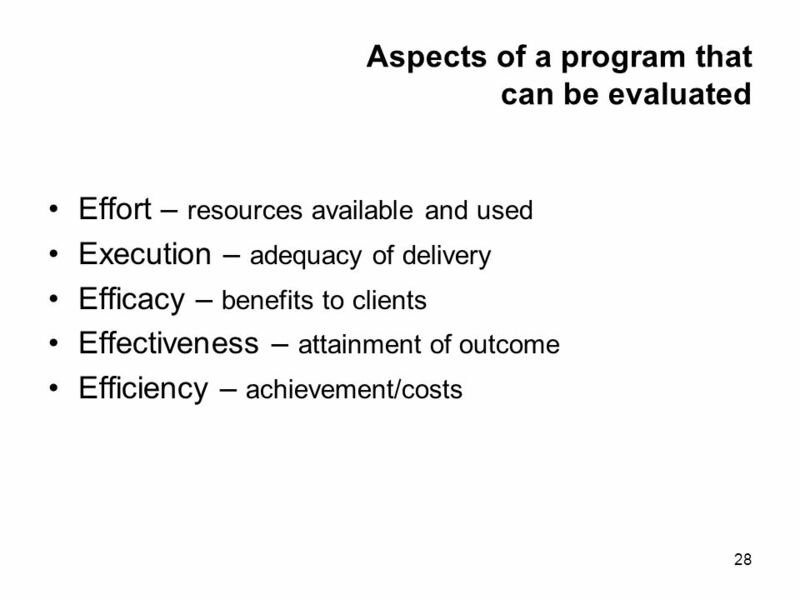 Objectives? Activities? 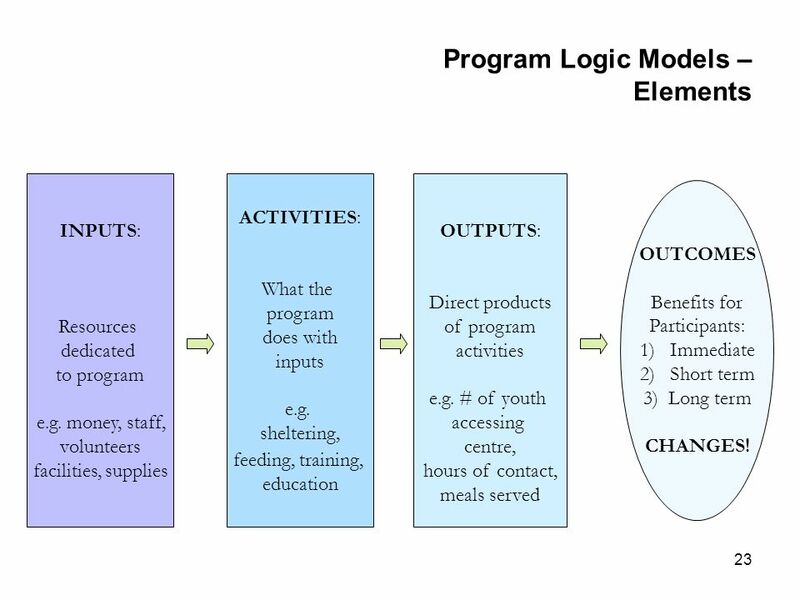 23 23 Program Logic Models – Elements INPUTS: Resources dedicated to program e.g. 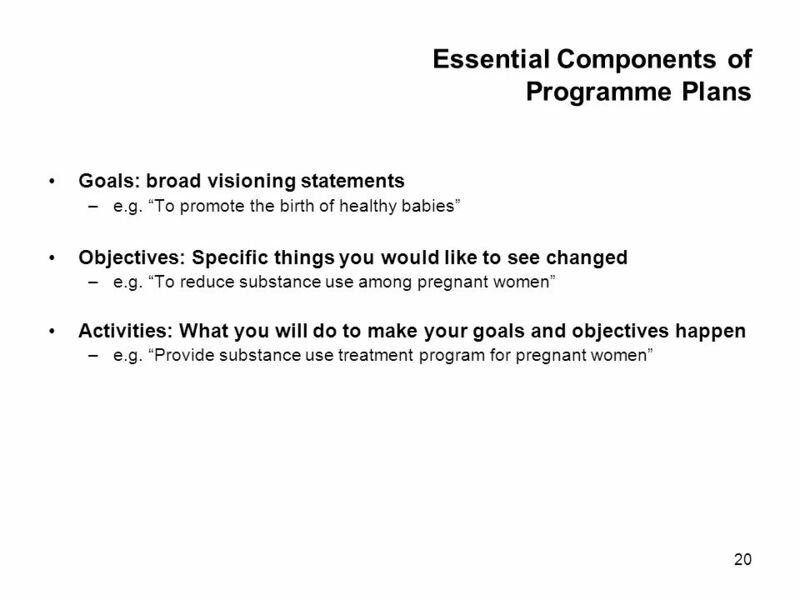 money, staff, volunteers facilities, supplies ACTIVITIES: What the program does with inputs e.g. 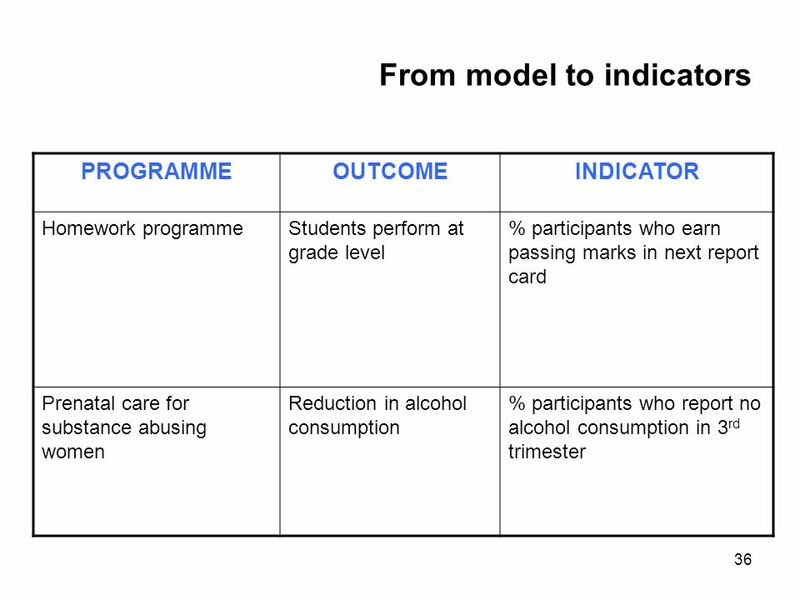 sheltering, feeding, training, education OUTPUTS: Direct products of program activities e.g. # of youth accessing centre, hours of contact, meals served OUTCOMES Benefits for Participants: 1)Immediate 2)Short term 3) Long term CHANGES! 24 24 Teen Sexual Health Information Program INPUTS: 2 staff $130,000/year Training space Web Server Phone Lines ACTIVITIES: Trains 100 peer sexual health counsellors Provide face to face peer counselling Host peer web site Host peer phone line OUTPUTS: Meet with 100 youth per week face to face Field 100 calls/night Field 1,000 online questions/month OUTCOMES Goal: To empower teens to make healthy sexual decisions. 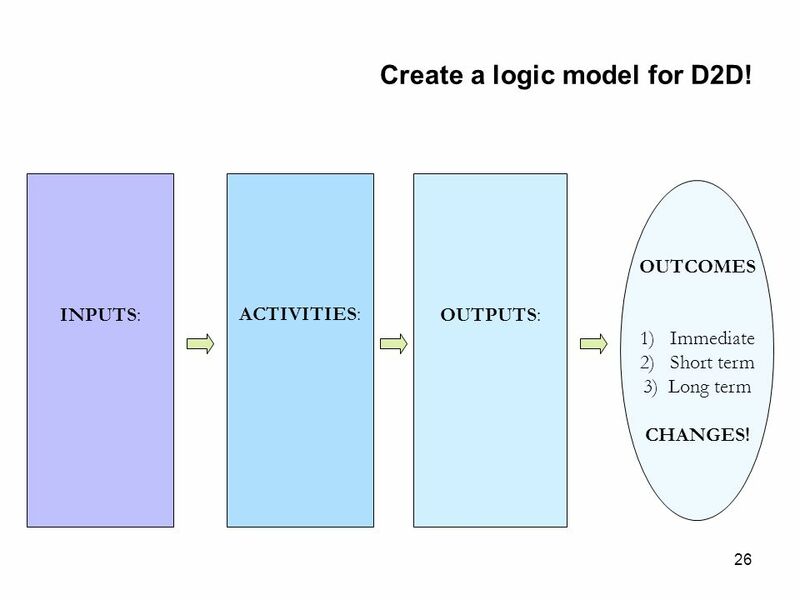 26 26 Create a logic model for D2D! 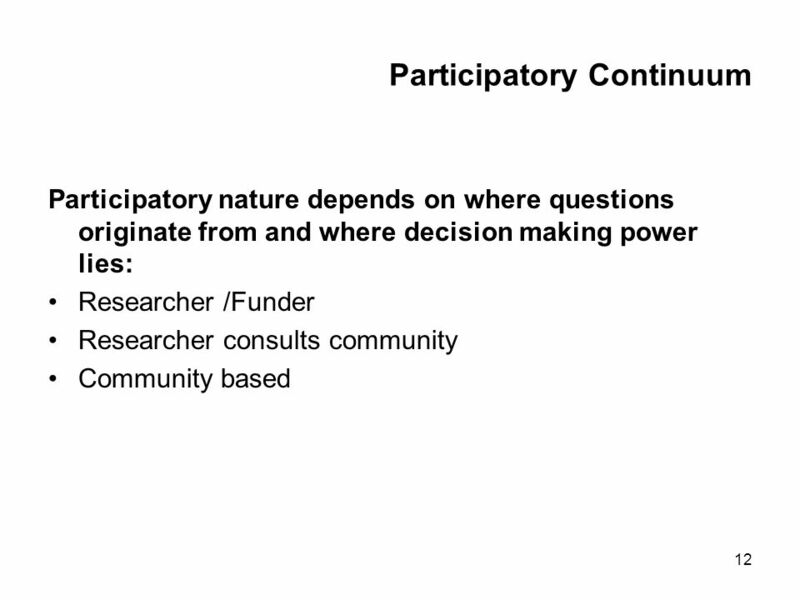 INPUTS: ACTIVITIES: OUTPUTS: OUTCOMES 1)Immediate 2)Short term 3) Long term CHANGES! 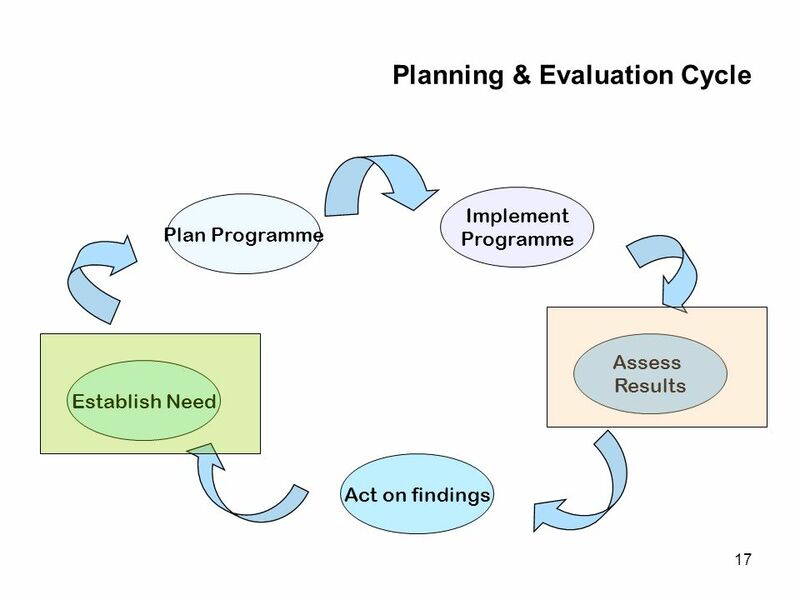 30 30 Relationship between Types of Evaluation: Quit Program PROCESSIMPACT Short term OUTCOME Long term ECONOMIC Practice/ programme EffectBenefitsCheaper e.g. What happened? Did people like it? Why? e.g. Did people stop smoking? e.g. Lower rates of smoking disease? e.g. 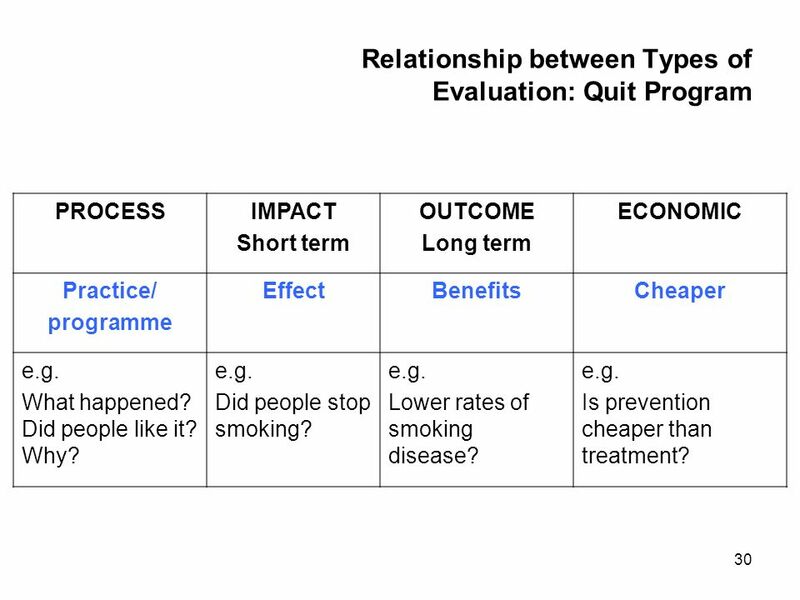 Is prevention cheaper than treatment? 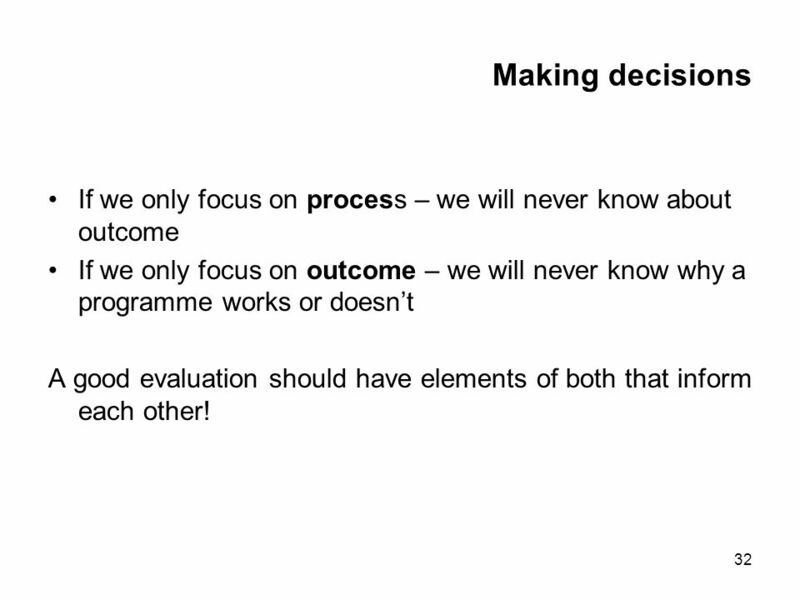 32 32 Making decisions If we only focus on process – we will never know about outcome If we only focus on outcome – we will never know why a programme works or doesnt A good evaluation should have elements of both that inform each other! 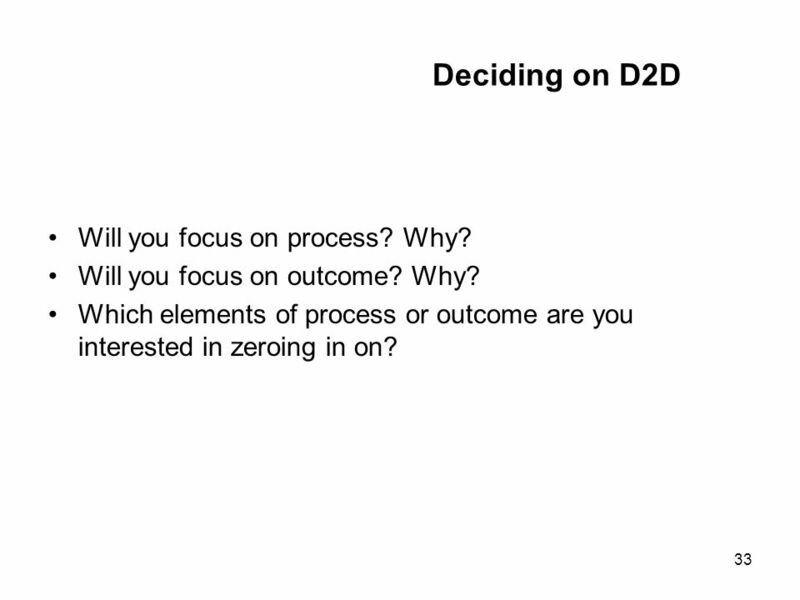 33 33 Deciding on D2D Will you focus on process? Why? Will you focus on outcome? Why? 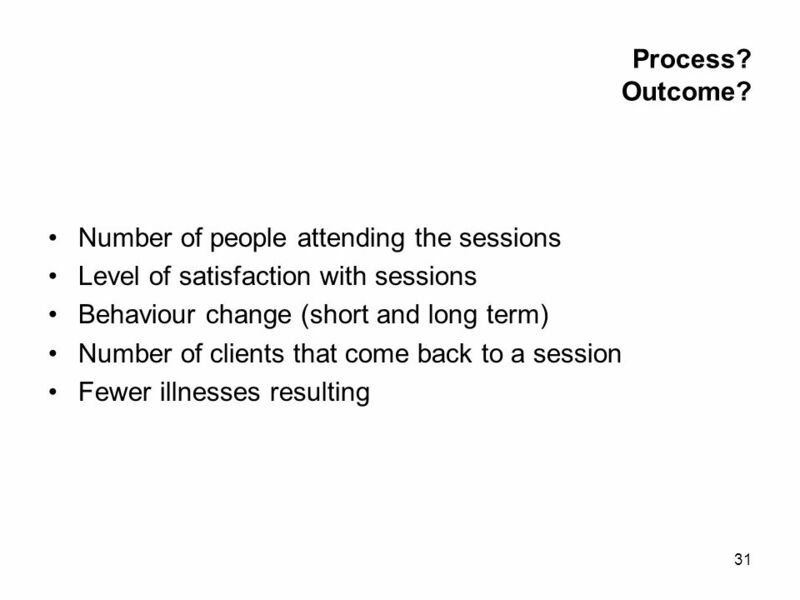 Which elements of process or outcome are you interested in zeroing in on? 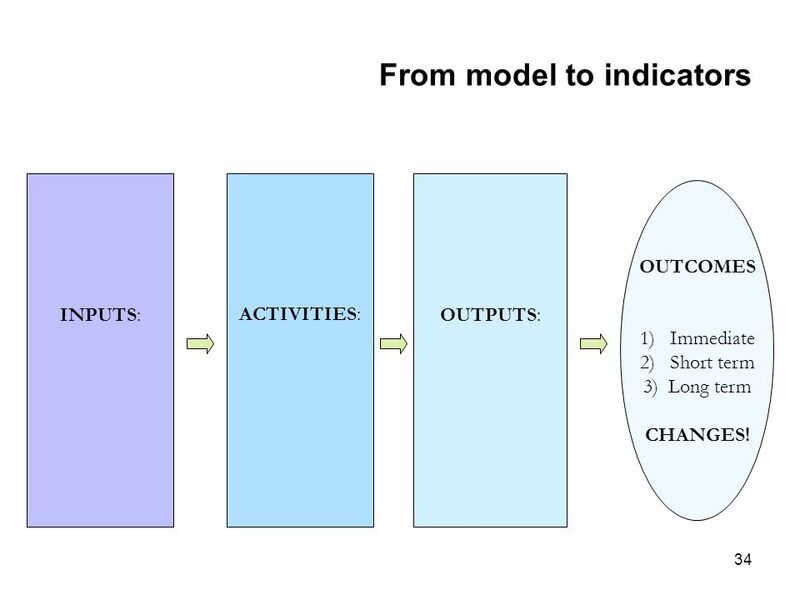 34 34 From model to indicators INPUTS: ACTIVITIES: OUTPUTS: OUTCOMES 1)Immediate 2)Short term 3) Long term CHANGES! 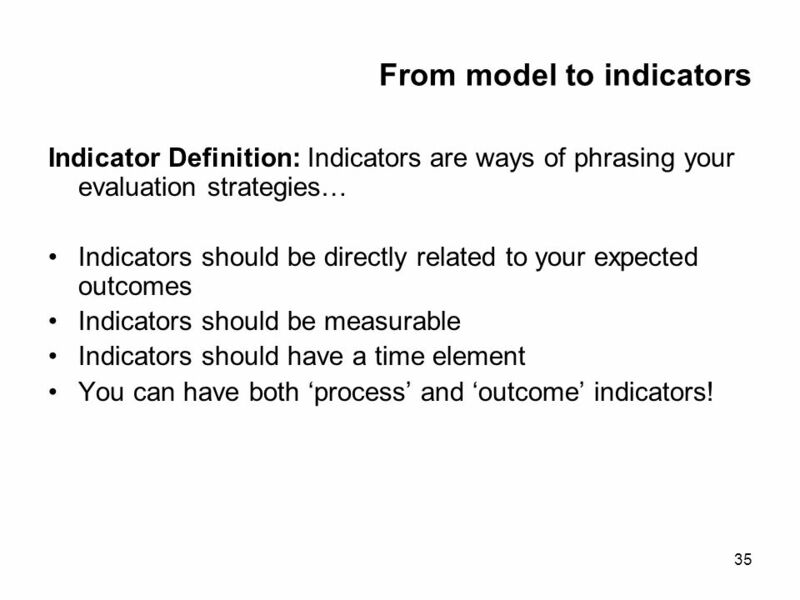 35 35 From model to indicators Indicator Definition: Indicators are ways of phrasing your evaluation strategies… Indicators should be directly related to your expected outcomes Indicators should be measurable Indicators should have a time element You can have both process and outcome indicators! 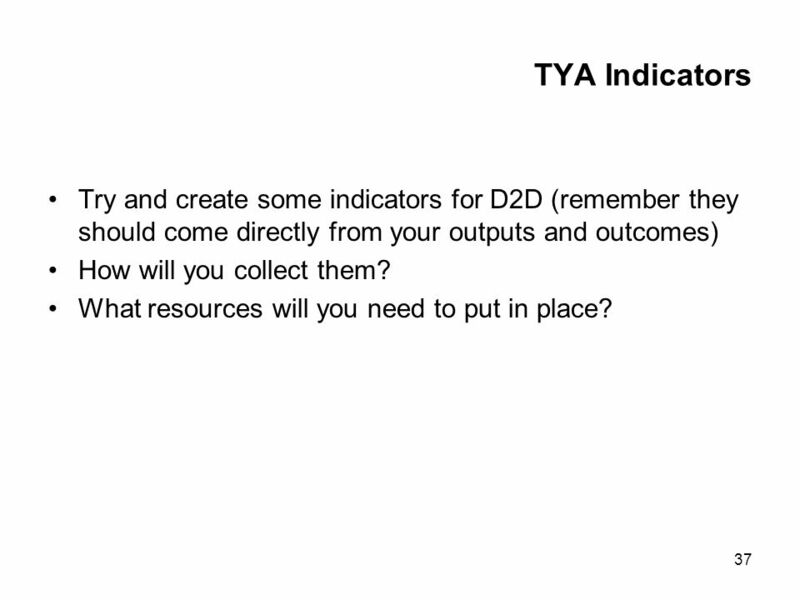 37 37 TYA Indicators Try and create some indicators for D2D (remember they should come directly from your outputs and outcomes) How will you collect them? What resources will you need to put in place? 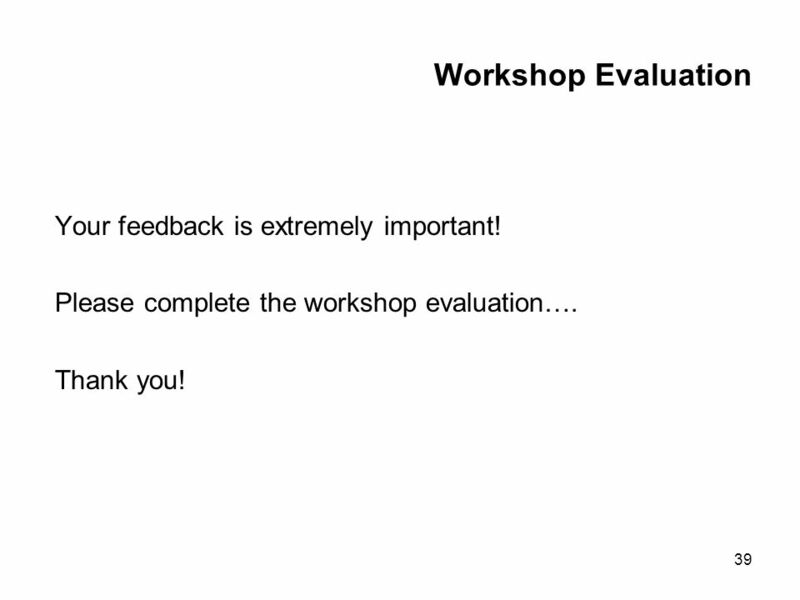 39 39 Workshop Evaluation Your feedback is extremely important! 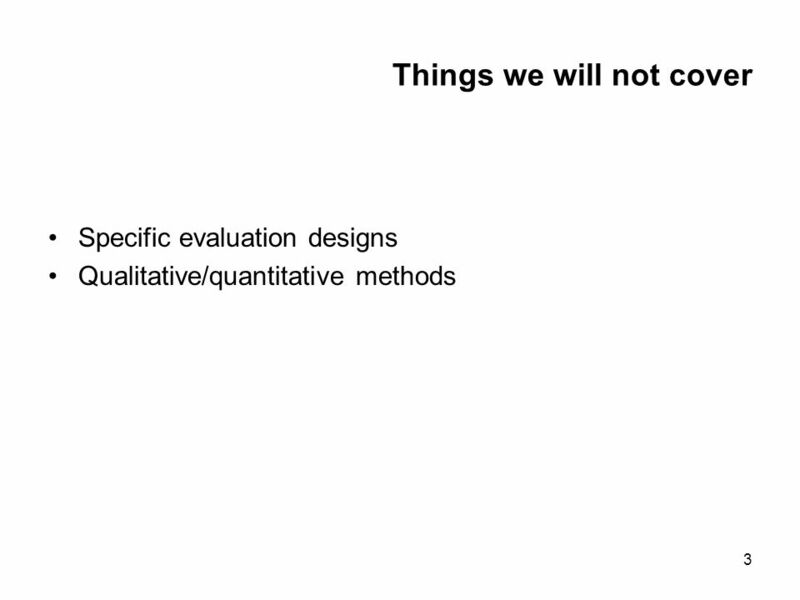 Please complete the workshop evaluation…. Thank you! 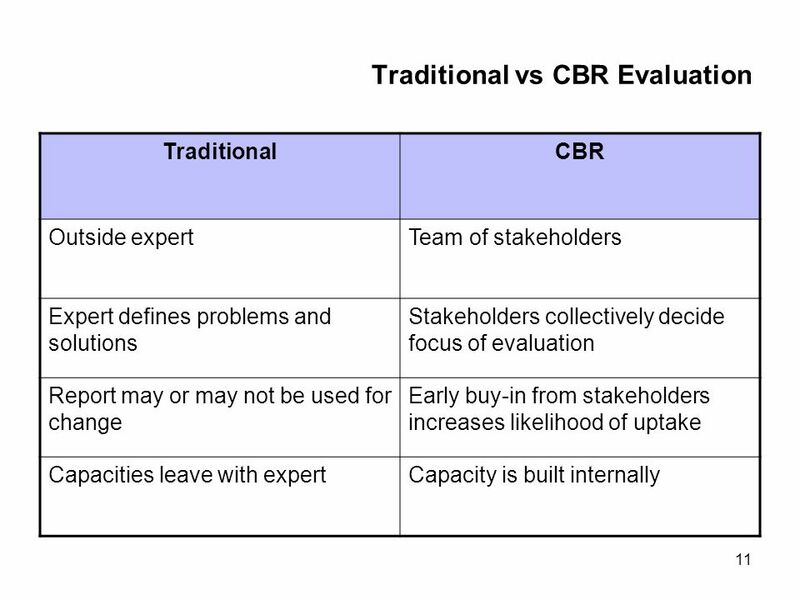 Download ppt "Community-Based Research Workshop Series CBR 304 A Participatory Approach to Programme Evaluation."